Bus from KL to Kuala Besut is the most convenient transportation option to reach Kuala Besut Jetty, before taking a ferry to the magnificent Perhentian Island. Kuala Besut bus station is just 5 minutes walking distance away from the jetty to Perhentian Island. 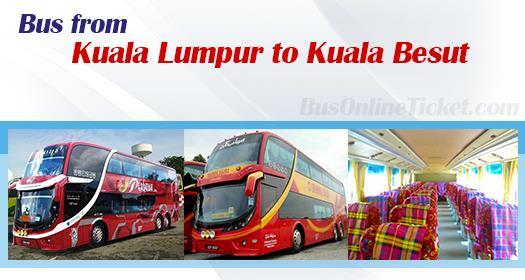 Perdana Express and Queen Express are the only bus operators who supply the bus from KL to Kuala Besut. Perdana Express provides 4 schedules daily, whereas Queen Express provides 2 schedule daily from KL to Kuala Besut. The bus fare is reasonably charged at RM 44.00. The duration required for bus from KL to Kuala Besut takes about 7 hours depending on traffic condition. Because of the long distance journey, the bus will have 1 stopover for toilet break. The bus fleet deployed for bus from KL to Kuala Besut is the spacious 3-seat-a-row layout VIP bus. Passengers can adjust the reclining seats to relax themselves during the hours-long journey. After the closure of Putra Bus Station (near PWTC), all buses going to east coastal Malaysia depart from TBS (Terminal Bersepadu Selatan) now. The arrival point in Kuala Besut is at Kuala Besut bus station. Passengers who are going to Perhentian Island can simply walk to the jetty which is just next to Kuala Besut bus station. Planning for a retreat in Perhentian Island? Book your ticket online with BusOnlineTicket.com now to avoid disappointment because of the limited daily trips. Online booking in BusOnlineTicket.com is simple and convenient. Upon payment, instant email confirmation will be sent to you.